In the 1800’s the rich got richer – they built factories to make things faster and cheaper. Of course the workers weren’t paid more. They were crammed into filthy houses with no toilets or baths and drank diseased water. 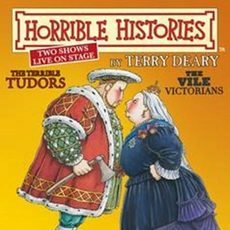 This is the material that Terry Deary works with to create his Horrible Histories and next week, New Brighton’s Floral Pavillion hosts a marathon two live shows a day performance from Tues 18th-Saturday 22nd September. To get tickets was not easy but then again, they never have been since the popular TV series went to stage. Using actors and ground-breaking 3D special effects, the two astounding shows Terrible Tudors and Vile Victorians -are guarenteed to thrill you and your kids. Historical figures and events will if it’s anything like the last performance I sat through…..come alive on stage and hover at your fingertips. In the Terrible Tudors from the horrible Henries to the end of evil Elizabeth, we will hear the legends (and the lies) about the torturing Tudors. We will find out the fate of Henry’s headless wives and his punch up with the Pope. And…..we will survive the Spanish Armada as it sails into the audience! In the Vile Victorians we will live the misery of the mines and the filth of the factories…dodge the rotten railways and duck the Charge of the Light Brigade! If you want to educate your offspring and give them a lasting historical knowledge in a fun way, then this is the gimmick factor that will do the trick.